Advocates Worry About Fitness Tracker Data Privacy : Shots - Health News Millions of Americans use wearable devices to monitor their diet and fitness. Some insurance companies offer incentives to use them, but privacy advocates caution customers not to share too much data. 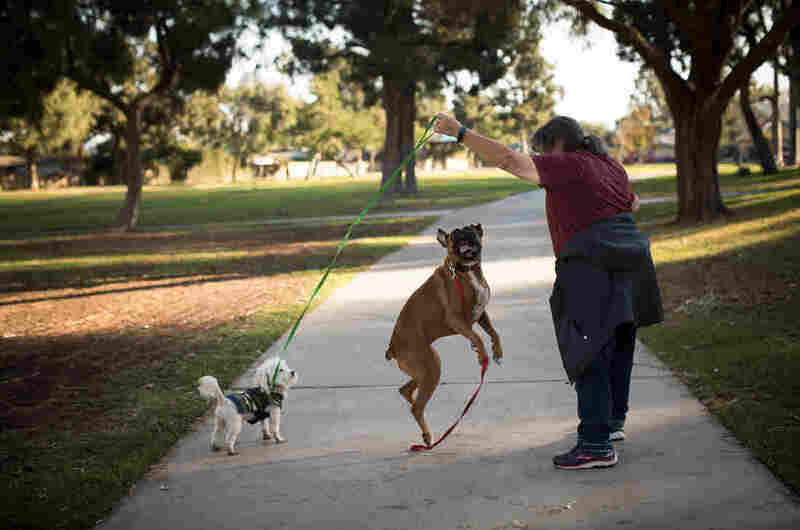 Kathy Klute-Nelson walks through her neighborhood with her dogs in Costa Mesa, Calif. She was offered $300 off her yearly health insurance premiums if she committed to walking every day. When Kathy Klute-Nelson heads out on a neighborhood walk, she often takes her two dogs — Kona, a boxer, and Max, a small white dog of questionable pedigree who barrels out the front door with barks of enthusiasm. The 64-year-old resident of Costa Mesa, Calif., says she was never one to engage in regular exercise — especially after a long day of work. 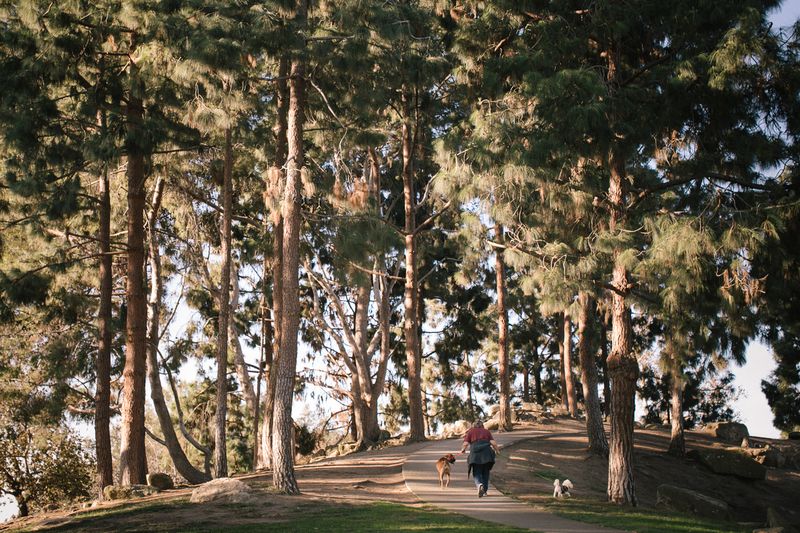 But about three years ago, her employer, the Auto Club of Southern California, made her and her colleagues an offer she couldn't refuse: Wear a Fitbit, walk every day and get up to $300 off your yearly health insurance premiums. "I thought, 'Why don't I try this?' " Klute-Nelson says. " 'Maybe it'll motivate me.' And it really did. You know, you get into little groups and you start walking around and come back and feel better." Help us make Shots more relevant for you by completing an NPR research survey. Click here to start the questionnaire. Today she's among the millions of Americans who use wearable fitness devices such as Fitbits that track an assortment of personal information — everything from movement and sleep patterns to blood pressure and heartbeats per minute. This year, an estimated 6 million workers worldwide will receive wearable fitness trackers as part of workplace wellness programs. That's up from about 2 million in 2016, according to ABI Research, a market research firm. Many of these voluntary programs offer workers free or discounted wearable trackers and annual financial incentives that range from about $100 to more than $2,000, depending on the company. For Klute-Nelson, the incentive money does the trick. 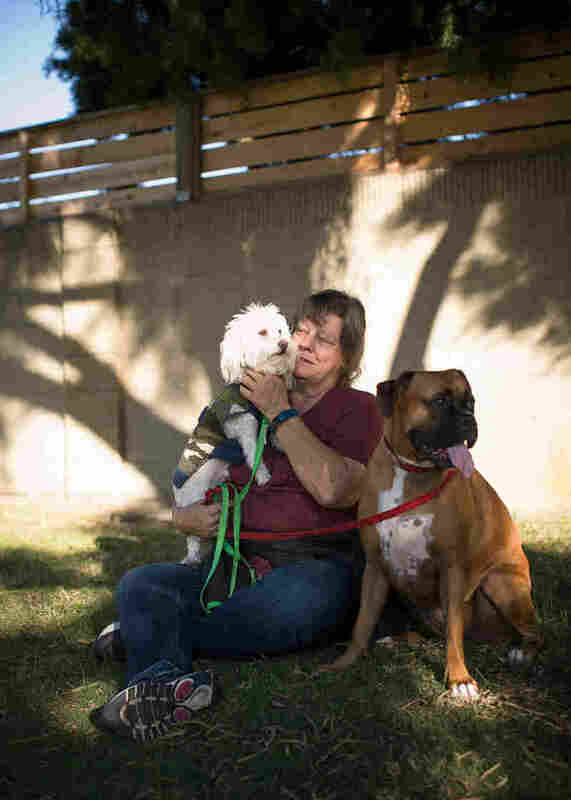 Klute-Nelson takes a break with her dogs Kona (left) and Max. "It really encourages you to get up and move," she says. "I mean, how many times do you get to the end of the day, you're in the office and you think, 'Gosh, I didn't really get up from my desk at all today.' "
For companies, encouraging workers to get fit makes financial sense, says UnitedHealthcare spokesman Will Shanley. Healthy workers should cost the insurer less and can be more productive. The health insurance giant offers employer-sponsored plans that promote three walking goals with an easy-to-remember acronym. "It's called F.I.T.," he says. "Frequency, intensity and tenacity." People who move frequently, walk with moderate intensity and log 10,000 steps each day can earn more than $1,000 a year toward health care spending. And, Shanley says, it's not just the already fit who are signing up for the program. "The participation rates for people with chronic conditions — diabetes in particular — is actually significantly higher than for people without those conditions," he says. But just how much fitness trackers contribute — if at all — to better health and lower health care spending isn't yet known. Among the studies that cast doubt on their effectiveness is one published in 2016 by the University of Pittsburgh. That research found young adults who used fitness trackers in the study lost less weight than those in a control group who self-reported their exercise and diet. Klute-Nelson says she was never a big exerciser, but the incentive money encouraged her to get up and move. "Right now what the clinicians are trying to figure out is what is the most effective use of this technology in order to engage patients," says Andrew Boyd, an assistant professor of biometrics and health information at the University of Illinois at Chicago and the associate chief health information officer for innovation and research at the University of Illinois Hospital. Boyd is cautious but confident that some of the ongoing studies will show positive benefits for patient health. But he urges taking care before trading data for dollars. It's important to know the type of information your tracker is revealing about your health, he says, and to know exactly how it will be used. Your incentives could offer a clue. "If [your insurance company is] offering you two or three times the amount of money that every other insurance company's offering you, there's something else they value in the data that they're giving you that cash for," he says. For instance, he says, if Congress ever repeals the Affordable Care Act, insurers could use the fitness data they're collecting today to deny you coverage based on a medical condition that your tracker detects. Shanley says his company collects only step data. The same goes for Oscar, a tech-driven health insurer that serves the individual market. 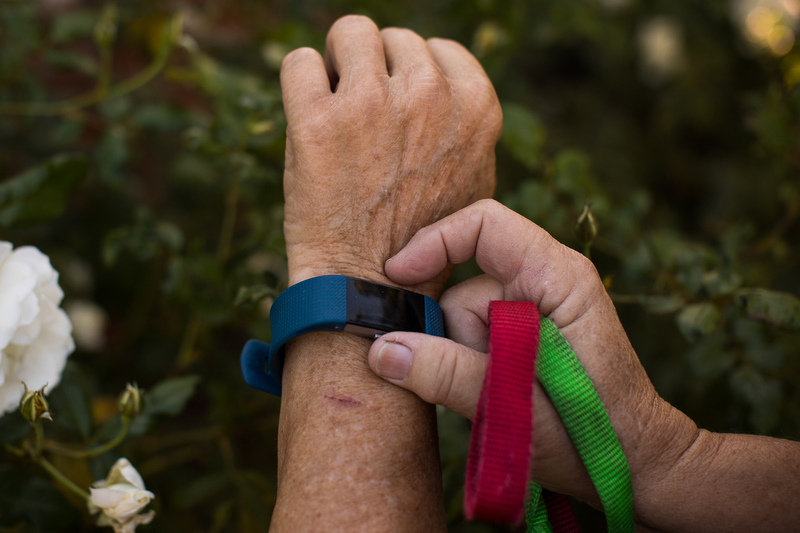 Senior Vice President of Product Sara Wajnberg says fitness tracking is done through Oscar's app, where customers are encouraged to log into other health care services that save them and the insurer money. "When people start engaging in step tracking, they engage in other parts of our product, like in telemedicine," she says. For instance, they can use the app to make a virtual doctor's appointment instead of going into an office or clinic for minor issues. Klute-Nelson says she sometimes worries about what could happen to the data her fitness tracker collects, but she's grateful for the financial incentives that keep her walking at the office and at home. "It's just that nudge," she says. "It's your mom: 'Get up and walk. Do something productive.' You know, that voice in your head you need, and that kind of has been helpful for me." Klute-Nelson walks through the park in her neighborhood with her dogs.